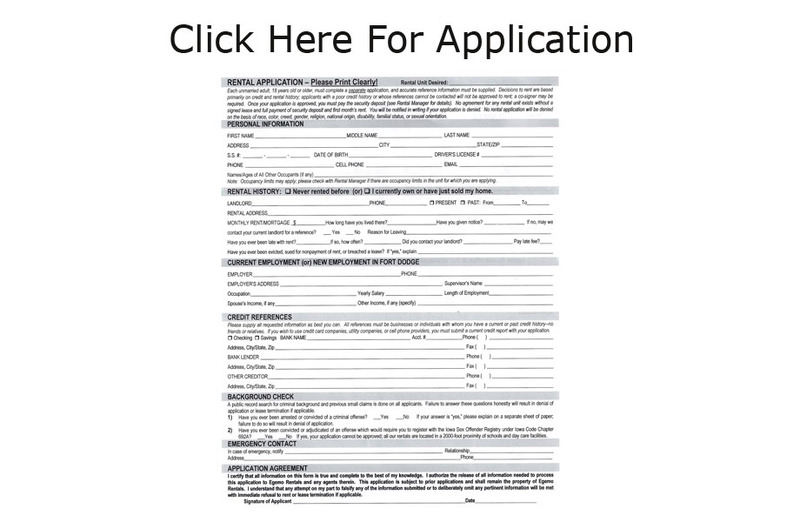 Our application process is free of charge — there is no obligation until you sign a lease, so please fill out the rental application completely and legibly and submit it to us at sale@egemorentals.com or fax it to us at 515-955-5579. From there we will schedule a showing of unit(s) you are interested in seeing. If any pertinent information is omitted or if the application is illegible, it may be returned to you to correct and resubmit. If you have a criminal background, you must disclose all criminal offenses and provide additional written explanation identifying all crimes, your involvement, when crimes were committed, and any penalties, fines and/or jail time served. If you are on probation, please submit the name of your Probation Officer and if we may contact him/her for reference. Failure to disclose all pertinent information in order for us to make a valid and informed decision to rent, will result in immediate refusal to rent. Applicants are evaluated on the basis of credit references, prior rental history, income information, and a background check. In keeping with the Fair Housing Act, no applicant shall be denied the opportunity to rent based on race, color, creed, gender, religion, national origin, disability, familial status, and sexual orientation. We require a one-year lease commitment and month-to-month thereafter. Students or other applicants with poor or no credit references or prior rental history are required to have a parental cosigner and submit to cosigner rules (contact us for more information). We do not take Section 8 housing. Except for a few single-family houses, our rental units are strictly NO PETS AT ALL TIMES. If you have pets, please inquire first before submitting and application to see if any pets are allowed. Egemo Rentals © 2012 - All rights reserved.